Declan Zapala looks around the cavernous sometime church hall as if he can’t quite figure out what he's doing here. 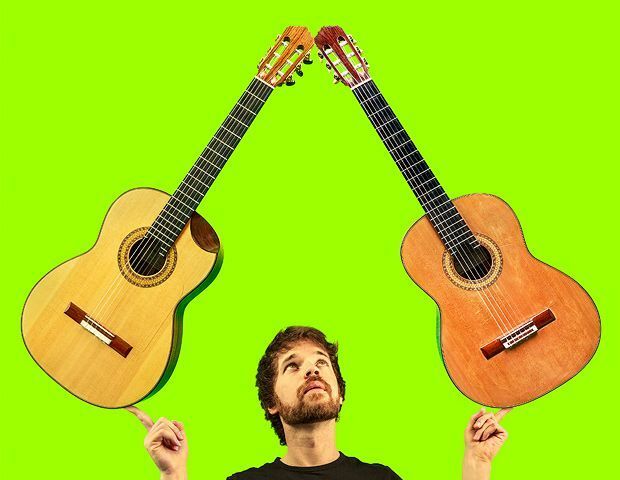 After all, his solo classical guitar sound is large, but it isn’t quite this grand. As the young player fiddles with his own sound equipment ('I used to be a sound engineer, I still like to do it as a hobby during shows') and fills the dead air rather nervously between songs, his skilful playing is somewhat offset by the sense that hosting a gig on his own is a rather new experience. 'Growing up I was quite nerdy,' he says, 'and it was always my dream to play a guitar show and call it something really nerdy.' He’s unsure of the title, but he likes the rather tangential fact that multiverses are theoretically created by a quantum event like a single cancer cell emerging, and that somewhere in another reality his hero Eric Roche – whose 'Spin' and 'Roundabout' he plays – didn’t die of the disease a decade ago and is playing here instead. Zapala's playing is crisp, formal and very capable; he performs his own music (lullabyish, and written for infant relatives), a version of Bach's 'Prelude in C' from The Well-Tempered Clavier, and Benjamin Verdery's hypnotic 'Keane, HI'. 'Radio 3 said I play "the acoustic guitar you hear in your dreams",' he beams proudly, '"although it’s actually classical guitar."' He did say he was a nerd. C too, 0845 260 1234, until 31 Aug (not 18), 5.45pm, £9.50–£10.50 (£7.50--£8.50).